Les Mausolées Royaux de Numidie, de la Maurétanie et les monuments funéraires pré-islamiques is part of the Tentative list of Algeria in order to qualify for inclusion in the World Heritage List. This T List site is made up of 6 locations, of which we visited 2 in Dec 2012. On the face of it there isn’t a great deal to see at either (you can’t get inside the tombs) but we found them of interest for opening a small window on the early history of a region which, to me at least was a “closed book” – I describe below our visits and some of the directions where “follow up” study of these tombs has taken me. Our first visit was to the Royal Mauritanian tomb (aka Tomb of the Christian) near Tipasa. Now this tomb is already inscribed as part of the Tipasa WHS – a fuller analysis of how this happened and a description of the tomb is to be found in my review of Tipasa (qv). In that review I commented that the “normal” attribution for the tomb is to Juba II and/or his wife Cleopatra Selena from c23AD but that it is now thought to date from an earlier period. I noted with interest therefore that the T List entry attributes it to “Bocchus” and 1st C BC. There were Bocchus I and II of Mauritania around 105BC and 49BC respectively (It could be interesting to follow up their relationship with events in Rome regarding Caesar, Octavius and Antony in which they appear to have played a part!) This suggestion is also made in the book I have about Tipasa – but that book also refers to the possibility that it goes further back to the 5th C BC. It would appear that there is as yet no compelling evidence with which to fix the date of this tomb. Which takes us to our second tomb – “The Medracen”. It is situated 36km NE of Batna, just off the road from Constantine and easily accessible by sealed road. It is surrounded by a fence and, if no one is at the gate, you wouldn’t miss much by not being able to go inside. This tomb looks very much like that nr Tipasa - but is smaller (photo). However, it has been carbon dated to around 3rd to 4th C BC which, given the very close stylistic similarities between the 2, would seem to support an earlier rather than a later dating for the Tipasa tomb. Now, I suspect that few people reading this review will previously have heard of “The Medracen” – I certainly hadn’t before going there. However, although it is “hidden” away in the depths of the T List of a developing country with no evidence that the entry is being developed for nomination this site does seem to be quite significant in N African archaeology and has in fact recently been “in the news”!! c. There is a 47 page description in French of the tomb on the web from 1973 here http://www.wmf.org/project/medracen-and-el-khroub-numidian-royal-mausolea . This was written by Gabriel Camps (1927-2002) – described in Wiki as “a prestigious scholar in Berber historical studies”. Not bad for such an apparently esoteric site!! I note that the article describes The Medracen as “le plus grand monument Punique encore subsistant en Afrique du nord.” Previously I had tended to follow the “Iliad myth” that the Carthaginians were essentially Phoenician émigrés, without understanding just how much “Punic Culture” was the result of an intermingling with Berber/Numidian culture to create something essentially different - still “Mediterranean” and linked to Greece, Rome and even Egypt but also something distinctively North African. The Punic remains of Carthage were of course virtually obliterated by Roman occupation and Tipasa etc also eventually became essentially Roman cities but here – near Batna some 200kms inland from the Mediterranean was something truly “Punic”! The exterior of The Medracen (and also the Tombeau de la Chretienne near Tipasa) clearly owes something to Grecian decorative concepts – as identified by Camps (page 484). But what about the “Pyramid concept” itself? This doesn’t seem to have Phoenician or Greek roots – did it too come west from Egypt or was it more local? Camps shows some Egyptian decorative aspects (page 486) but the very concept of this type of circular pyramidical tomb seems to have deep Berber roots. It appears that such tombs known as “Bazina” exist in proto-historic sites across North Africa – here is an article about some in the Western Sahara - http://nickbrooks.files.wordpress.com/2012/08/sahara17_06_brooks1.pdf . 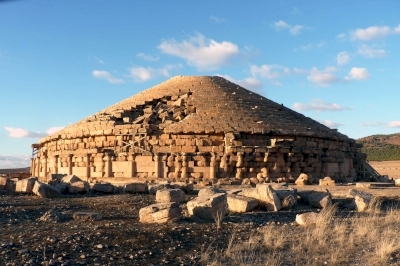 To continue the theme of Numidian/Berber/Punic links across the Maghreb, the Wiki article on the Tunisian WHS of Thugga has a picture of a circular “Bazina tomb”. I was somewhat surprised to note that 2 of the tombs we didn’t visit are dated to the 5th C AD – one is situated as far south as Tamanrasset, well into Touareg country. But photos of them on the Web show them as essentially circular stone mounds with a Berber background (even the Tamanrasset one) so, perhaps linking them all together in a single nomination does have justification. Whether it will ever come to fruition is another matter – but it has already provided at least me with an interesting visit and subsequent “research” subject!